One year after rising to claim the third spot on the annual Fortune 500 list, Apple hasn't moved places in 2017 and remains #3 on the list of the top U.S. corporations based on gross revenue. Going back seven years, Apple's previous rankings include 5th place in 2015 and 2014, 6th place in 2013, 17th place in 2012, 35th place in 2011 and 56th place in 2010. A few rankings surrounding Apple have shifted around in 2017, however, with Berkshire Hathaway and Exxon Mobil swapping places this year. In 2016, Berkshire Hathaway sat at #4 on the Fortune 500 while Exxon Mobil was #2, and this year Berkshire Hathaway climbed to second place while Exxon Mobil dropped below Apple to sit in fourth place. Otherwise, Walmart is still #1, with the rest of the list rounded out by companies like CVS (#7), AT&T (#9), Alphabet (#27), Microsoft (#28), Disney (#52), Netflix (#314), and Tesla (#383). Apple's profile on the Fortune 500 list this year talked about the company's recent sales troubles with Apple Watch and iPad, as well as an increasing reliance on iPhone sales, stating that, "Apple finally appeared to hit a wall." References were also made to Apple's look forward into an self-driving vehicle system and its focus on software services. After more than a decade of solid growth fueled first by the iPod music player and then by the even more popular iPhone, Apple finally appeared to hit a wall, with lackluster sales—relatively speaking—for other products such as the iPad and Apple Watch and a heavy reliance on upgraded phone models. But the most profitable publicly-traded company in the world is investing heavily in software and its efforts in new areas of opportunity, including automobiles, remain in development (and under wraps). Apple was founded in 1977 and is headquartered in Cupertino, Calif. This year marks 23 years that Apple has been on the Fortune 500 list, with $215.6 billion of revenue in the 2016 fiscal year, down 7.7 percent from the previous year. Apple's annual profit also dipped down to $45.6 billion -- a 14.4 percent decrease -- but still remained more than the annual profits of Walmart ($13.6 billion) and Berkshire Hathaway ($24 billion). This is what happens when you run a doomed company. It cracks the top 10 in the Fortune 500. It's telling that you have nothing bad to say about Exxon Mobil. It was surprising that despite their preoccupation with the upcoming big move, they still managed to come up with such an impressive roster of worthwhile hardware refreshes and promising new software features. I was reading that this was the most hardware Apple Has launched during any WWDC and it was totaled around $34,000 worth of hardware with upgraded specifications and new product releases. But some will still find a way to complain that Apple doesn't care about their product line. Clearly on a downward spiral. As a more concrete example, Verizon today disclosed a settlement where they have to repair many thousands of dangerous telephone poles, that they previously did not want to repair to increase their short term revenue. That is part of the reason why pure revenue growth looked at in isolation is not a good prognostic indicator of the company's future success. For example, Apple could raise the cost of the next iPhone to start at $1000 and go up to $2000. They would invariably increase their revenue, but likely their user base would diminish, and downstream effects from that contraction could potentially be more damaging than any short term gain in revenue. I hate to break it to you, but not all of Ford and GMs vehicles are built in Mexico. 64% of Fords and around 70% of GMs North America production is in the USA. The remaining 36% for Ford and 30% for GM is split between Canada and Mexico. If your going to make wild claims do some research first. Got the sarcasm. 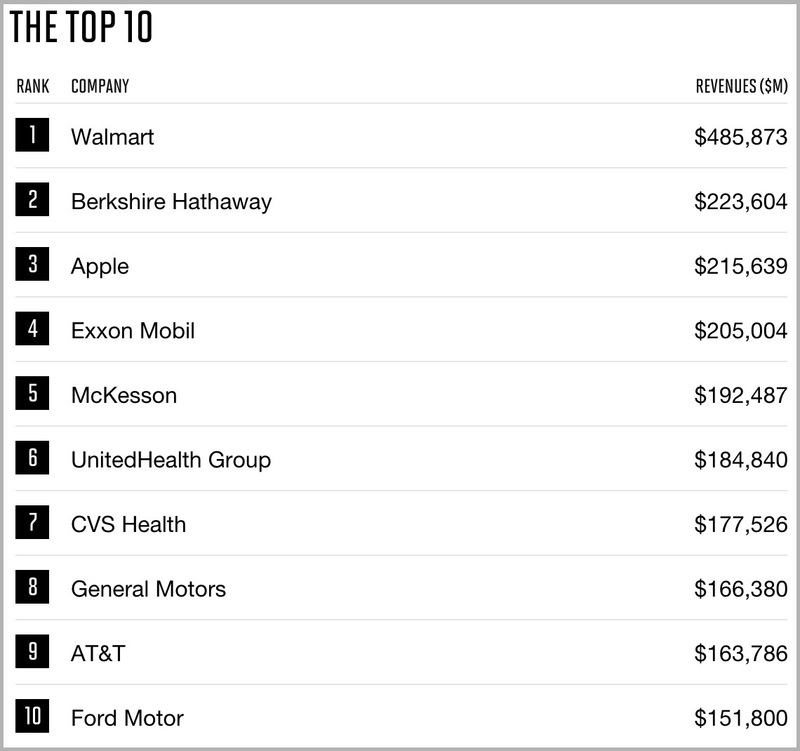 It's interesting this ranking is based solely on revenue, and worth noting that Apple still ranks #1 by profits. This is nice and all but Steve didn’t care about this stuff, he did to an extent but not nearly as much as Tim. He cared far more about creating amazing products with the user experience to match for us which should always come first. Unlike today which ranges from frustration to “meh” to just OK.